That Devil’s Madness alternates between two time periods but the story is seamless. In classic Wilson style, she sprints through the early history—but for those impatient readers I say don't despair—the book quickly latches onto the main character’s story. Nicolette’s relationships are brought to fruition and as she finds herself searching for her past the story takes a nail-biting, edge-of-your-seat, turn—until you flip the last page and think: academy-award movie script? But it’s not just a spellbinding story. 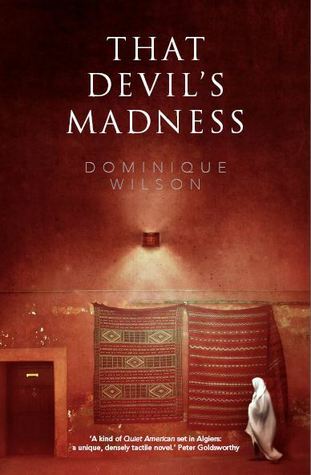 Between subtle comments on religion such as, “More out of long forgotten habit than faith, [she] dipped two fingers in the holy water of the font,” and fascinating descriptions of customs and traditions, Wilson weaves a tale of friendship, betrayal, love and atrocity. My absolute favorite line—though there are many to choose from: “Independence isn’t the same as freedom . . .” My only complaint is that I’ve finished the book and now have to wait, who knows how long, for the next Wilson saga. Wilson's books are difficult to find in the American market but these two sites may be helpful. Sign into Goodreads to see if any of your friends have read That Devil's Madness. Sounds interesting, Linda. Added to my list to read when it comes over to the U.S. I think you'll be glad that you did! Happy Holidays. Linda wrote: "I think you'll be glad that you did! Happy Holidays." Thanks, and Season's Greetings to you too!